On Thursday, March 12 at 6pm in Rare Books & Special Collections (McLennan Library Building – 4th floor), join McGill University Library & Archives and the Friends of the Library for this special talk as we celebrate the publication of Meetings with Books: Special Collections in the 21st Century. Alberto Manguel will be in conversation with Dr. Jillian Tomm, Assistant Head, Rare Books & Special Collections, McGill University Library and Archives. Join bestselling author Melissa de la Cruz for a special talk and Q&A as she signs The Gates of Paradise, the final novel in the epic, heartbreaking Blue Bloods series. Proof of purchase required from any Indigo, Chapters, WBB or Coles location or online. Will personalize and sign The Gates of Paradise and any other titles purchased at the event. 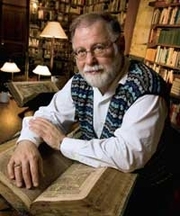 Alberto Manguel is currently considered a "single author." If one or more works are by a distinct, homonymous authors, go ahead and split the author. Alberto Manguel is composed of 16 names. You can examine and separate out names.